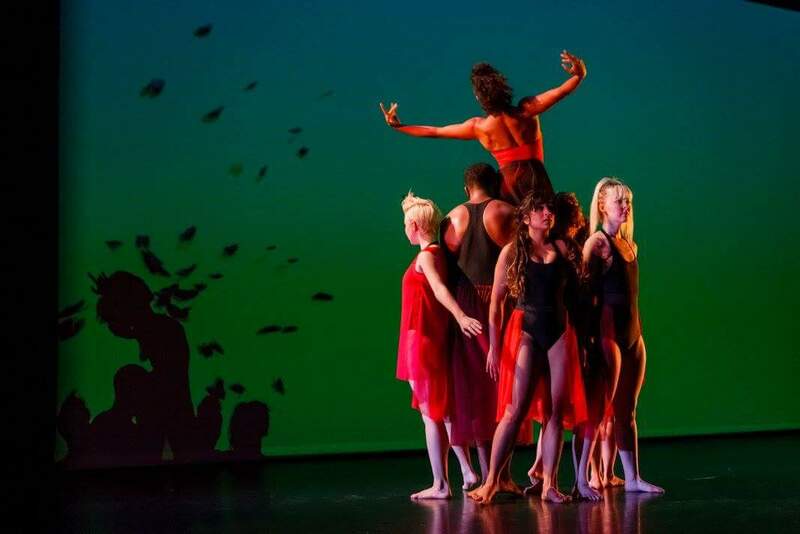 Ash Danceworks, one of Houston’s newest contemporary dance companies, made its inaugural debut with BEETHOVEN RECNSTRCTD last Friday evening with a repeat performance on Saturday. Though the company is new, its director is certainly familiar to anyone who has been paying attention to the fringier perimeters of the Houston dance scene for the last decade or two. Ash Danceworks was founded last May by Rebecca French after she stepped away early in the year from FrenetiCore, a dance company the choreographer co-founded and helmed for over 10 years, and its shabby-chic venue, Frenetic Theater, now called the Pilot on Navigation. French is known for mixed-media collaborations that are often conceptual yet theatrical, her appreciation for and connection to a wide-range of music frequently in the foreground of her choreography. Just last year, she and her collaborators presented The Rite of Summer, inspired by Stravinsky’s epic work of a similar name. In choosing to structure her first Ash Danceworks project around an electronic adaptation of Beethoven’s Violin Concerto in D major, French makes it clear this new endeavor is a continuation of her vision and not a departure. It could be tempting to fix what isn’t broken about Beethoven’s well-loved concerto but BEETHOVEN RECNSTRCTD composers Richard Ford, who re-imagined the first and third movements, and John Edward Ross, who took on the dreamy middle movement, have created an electronic adaptation that feels faithful to the score. One wonders what Beethoven might have chosen to do with today’s musical tools at his disposal. Like a bust sitting atop a piano, a line-image of Beethoven is projected on the stage backdrop as audiences arrive to the intimate MATCH theatre. As the music begins, the edges of the graphic diverge and fracture into dozens of pieces. These abstract digital projections by Tim Thompson are an effective addition to French’s choreography as points of light and color gather into galaxies behind groups of dancers or swirl across the screen in arcs and waves. Near the end of Movement 1, which in this production is titled Night, dancers pause as though star-gazing at the imagery that’s been a participant in their dance all along. That this acknowledgment stands alone throughout the work seems like a missed opportunity to more fully merge Thompson’s choreography of light with French’s human menagerie. The Ash Danceworks cast includes dancers previously seen on the roster for FrenetiCore performances as well as some fresh faces. Prior to the performance French announced that the acute injury of Timithy Holecek would bring her small cast of eight down to seven. Among the remaining company members, Kayla Collymore, on loan from METdance, was a stand-out, her lithe strength used effectively by French in a solo during the third movement. Young Siri Ell was also eye-catching and the experience of Roberta Cortes and Holly Moran helped ground the ensemble which was enhanced with performances by Tawnya Kannarr, Nina Lahoti, and James Pitre. French’s musicality comes through most during the meaty first movement of the concerto. Costumer Ashley Horn Nott’s blocky black and white costumes are treated with an occasional tulle bustle and fluorescent piping reminiscent of the wisps of color featured on the backdrop. Unique hair styling and bright makeup on the dancers adds to the punk sensibility of this look. Intense ultraviolet light greets the short second movement, Dusk, as dancers roll, slink and camber across stage in sleek unitards shaded with an abstract pointillistic design. French makes the most of the deliciously languid music by focusing on line and shape, lending mystery to Beethoven’s sweetest and most romantic strains. The choice enhances the contrasting brightness and exuberance of the third and final movement, here titled Day, which bursts forth with a flurry of auburn butterflies on the backdrop as dancers launch onto stage. Composed in just a few weeks, Beethoven’s one and only violin concerto was completed a mere day or two before its first scheduled performance and is suspected to have been mostly sight-read by its soloist for a somewhat rocky debut. Like the composer’s premiere, BEETHOVEN RECNSTRCTD showed promise and inventiveness despite a degree of unpreparedness in its execution. Occasional collisions and awkward inconsistencies dotted the opening night performance. How much of this was because of the reconstruction of choreography that must have been unavoidable with a missing cast-member, is hard to say. Imperfections aside, BEETHOVEN RECNSTRCTD was a fresh take on a classic work and succeeded as a fresh start for French. Notably, an introductory offering by another new company, Group Acorde, was included in the brief hour-long program. Featuring soloist, Roberta Cortes and music composed and performed onstage by Seth Paynter, (sub)conscious was a fitting opening. Cortes’ off-kilter deconstructivism was a compelling match for the increasingly discordant sounds issuing from Paynter’s saxophone. It’s clear Group Acorde as well as Ash Danceworks will add bold and unique contributions to the panorama of Houston contemporary dance.